Step right up and experience all the fun and excitement of the funfair with Carnival Games. As many as four players can join the multiplayer madness as the you hit massive home runs, take your horse speeding over the finish line or come first using your all important cake stacking skills! You can hone your talents and skills on over 20 unique games of chance and skill to win amazing prizes and unlock crazy costumes and hidden super-games. It's wholesome family fun that you might even be able to entice your grandparents to play. 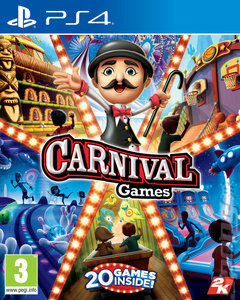 Carnival Games features over 20 of the most popular games seen in midways and boardwalks throughout the world, including shooting hoops in 'Swish' and taking on nasty clowns in 'clowning around'. These classics are joined by a few new (and slightly more out there) additions like drone racing ('light speed') and cosmic bowling ('cosmic strike'). Points mean prizes, too! Play games to win tickets and trade them in for new clothes to dress your carnival guest characters up in. You can match your own style or get as wacky as you like with madcap head gear, shirts and bottoms. It's a night out in a box, without any of the dangers associated with candy floss!